Gum disease is a chronic, though common condition, resulting from a buildup of harmful oral bacteria. While professional cleanings are typically sufficient to address the condition in its early stages, patients suffering from advanced periodontitis may require a gingivectomy. This procedure, which involves the surgical removal of diseased tissue, is typically performed by a periodontist or oral surgeon. The treatment is generally quick and minimally invasive. Patients can typically return to normal activities the same day. With proper aftercare and diligent oral hygiene, gingivectomy can be an important step to help gum disease patients manage their condition. 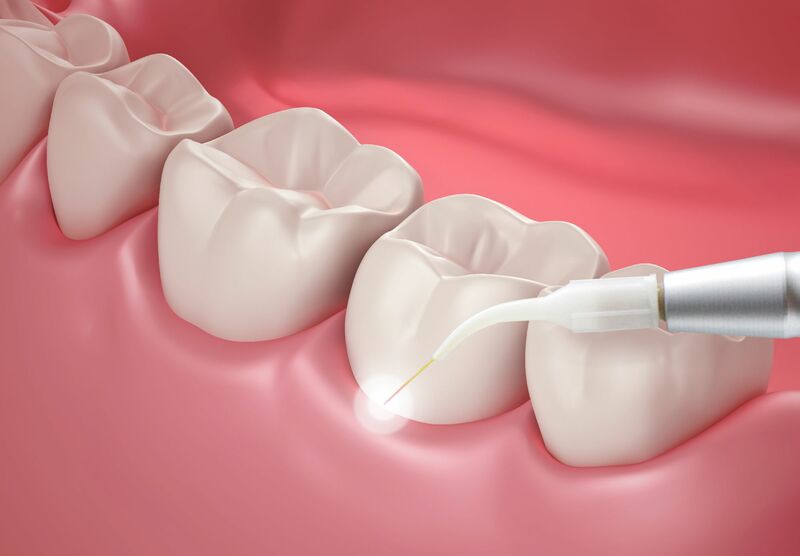 During a gingivectomy, the doctor will use manual techniques or a soft tissue laser to gently remove damaged tissue. When Is a Gingivectomy Necessary? Dentists typically begin with the most conservative treatment options. However, if the condition is too advanced for scaling and root planing (a deep cleaning) or antibiotics, surgery may be necessary. To make an appropriate treatment recommendation, your dentist or periodontist will conduct a complete evaluation, which may also include x-rays to screen for signs of bone loss. A gingivectomy can be vital, not only to a patient’s smile, but to their overall physical health as well. Prior to surgery, the doctor will administer local anesthesia to numb the treatment area. Some practitioners may offer additional sedation options, such as nitrous oxide, oral conscious sedation, or intravenous (IV) sedation. Though these are not usually necessary to eliminate discomfort, they can help to put anxious patients at ease. After supplying the appropriate medication, the doctor will carefully trim away the damaged tissue using manual techniques or a laser. Simultaneously, they will also reshape the gums and reposition the tissues around the dental roots, if necessary. Once the process is complete, the doctor may place surgical dressings and stitches in the treatment area to protect the gums as they heal. Depending on the extent of the procedure, a gingivectomy could take up to an hour. Many surgeries, however, take just a few minutes. Sometimes, a doctor may also provide topical medication to discourage the growth of bacteria. Healing after gingivectomy may take a few weeks, although symptoms should subside within a few days. Most patients can return to their normal activities as soon as the anesthesia wears off. For the first day or two, bleeding may occur, especially following traditional surgery. Biting down on a piece of gauze can help to staunch blood flow. Swelling and inflammation are also likely. Mild anti-inflammatories and ice packs can minimize discomfort and help swelling to go down more quickly. A soft diet is also an important part of the healing process. Even after patients are able to eat a more varied diet, they may need to avoid spicy and very crunchy foods for a few weeks, as these can irritate the surgical site. Finally, patients should be especially careful when brushing their teeth, and they should use an antibacterial mouthwash to reduce the risk of infection. In addition to following post-operative guidelines, it is essential that patients attend follow-up appointments so that their practitioners can check for signs of any complications. If dressings or non-dissolvable stitches were applied, these will typically be removed a week to ten days after surgery. In addition, these follow-ups allow doctors to determine whether additional treatment may be necessary. For example, if there is evidence of jawbone recession, patients may require a bone graft. Although a gingivectomy can eliminate damaged tissue, there is no permanent cure for gum disease. In order to minimize the risk of recurrence, patients will need to be proactive and vigilant in maintaining their oral health. Periodontists often recommend three to four cleanings and exams a year for patients who are prone to reinfection. With additional visits, they can more effectively monitor gum health, treating the first signs of a flare-up. They may also suggest specialized rinses and other products to target oral bacteria more aggressively. With this level of attention, many patients can avoid serious gum damage and tooth loss. A gingivectomy can be vital, not only to a patient’s smile, but to their overall physical health. Left untreated, periodontitis would eventually lead to widespread tooth loss. At the same time, gum surgery may help to minimize your risk of developing certain serious health concerns. Periodontitis has been linked to a higher risk for heart disease, stroke, and complications during pregnancy. Patients should seek periodontal care as soon as they observe the first symptoms of gum disease. With the help of a qualified doctor, they can enjoy a beautiful smile, improved oral health, and peace of mind for years to come.